My ideal goal was to run a 2:45 marathon. My second goal was to run a personal best, which I missed by a mere 35 seconds. I had to settle for my third goal, running a marathon in less than 2:50. Yes, I’m disappointed. I’m also very confident that the changes to my training are paying off. I just may need to wait a little while longer to get a personal record. I experienced many emotions the day of the race: excitement, anxiety, embarrassment, joy, anger, happiness, disgust, shock, disdain, fear, amusement, acceptance, disappointment, and denial. Physiologically, I experienced: pain, extreme pain, discomfort, light-headedness, nausea, torn skin, bleeding, hunger, thirst, and inability to stand upright. Jeff and I traveled to Wrightsville Beach on Saturday. Upon our arrival, I picked up race packet, including bib (number 400) and chip. The expo was exceptionally small. I bought Jeff and myself each a tee shirt. I also purchased some salt tablets (as I knew I’d need some for the race and had forgotten to pack them) as well as a hat. I woke up at 4, and completed my typical pre-marathon routine, including eating a honey grain bagel with peanut butter and honey, and a banana. I also made sure to drink much water, as I knew the day was going to quickly turn warm. The race began just west of the Banks Channel. The race start was postponed until 6:40, so, we were told, that there would be enough daylight for runners to safely race. (Jeff informed me that it was because so many runners were still attempting to get to the start.) I briefly spoke with Tim S., who ran and placed second in the half. The announcer asked that the fast runners move to the start of the line. Surprisingly enough, no slower runners did so. The gun went off at 6:40 and the first 20 or so runners, including yours truly, took off and almost immediately formed a single-file line. Just before mile 1, we crossed the drawbridge. Fortunately, the organizers had stationed volunteers to inform us that the bridge was slippery, and indeed it was! I stayed on the sidewalk to avoid the grate; nonetheless, even the sidewalk was very, very slippery. Mile 1, 6:15. Mile 2 was on Eastwood Dr., and I stayed on pace, 6:14. Miles 3 and 4 were on the dreaded, awful, Military Cutoff Rd., a heavily traveled, straight section of road exposed to the elements. I ran these miles in 6:04 and 6:09, a little faster than I intended, perhaps because I was so bored. 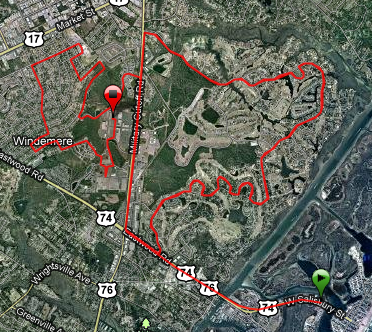 Just after mile 4, the course took a sharp right turn into Landfall, a gated community. The homes are beautiful, and there were many spectators stationed along the course. I saw many of them twice! Mile 5, 6:12; mile 6, 6:24; mile 7, 6:20; miles 8, 9 and 10, 6:26, 6:27, and 6:26. I began to lose some focus, as my calves began to ache. Just past mile 10, the course took another sharp right onto Eastwood Dr., then yet another sharp right onto the dreaded Military Cutoff Rd. Miles 11 and 12, 6:19 and 6:17. You guessed it, yet another sharp right turn into Landfall for the second trip through the neighborhood. I was anxious to see my time at the halfway mark, as I had kept my breathing for the first half at one breath every fourth step, and planned on picking up the pace and breathing at the half. I ran mile 13 in 6:15. 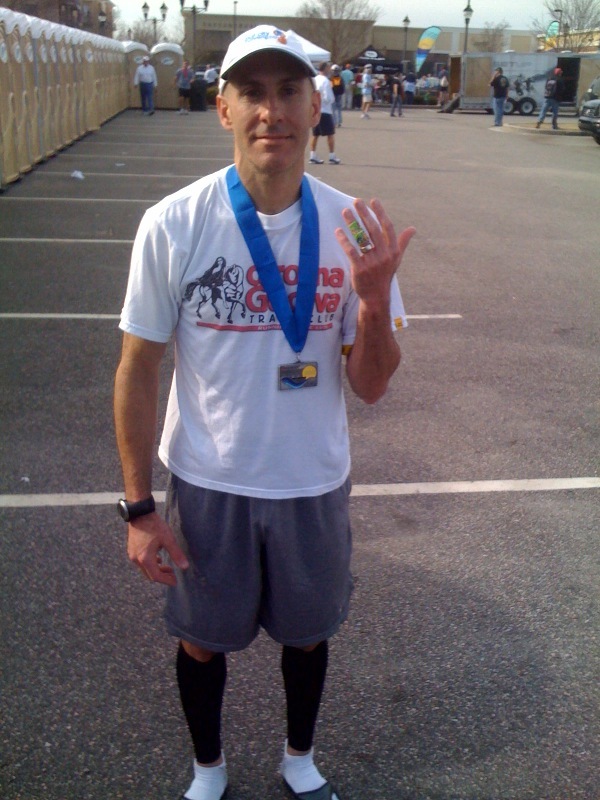 Time at 13.1 was 1:22:45—exactly the time I was shooting for! It was at about the halfway point that I began passing half marathon runners. They fell into four categories: (1) those that remained alert and made way for faster runners (about 15%); (2) those that cheered for me (another 15%); (3) those that muttered sh*t, d@mn, and even f%ck (as in “F%ck, he’s going fast!”) as I passed (20%); and (4) those that were completely oblivious to me, often running four or more across and taking up the whole lane, wearing headphones and unable to hear my warning that I was passing, adjusting hair and/or clothing and elbowing me as I passed, stopping to walk as I was running through a group of them, etc. Yes, this included the remaining 50% of runners. The throngs of half marathoners continued to increase, and I had to do much weaving and dodging from mile 13 to mile 21. Mile 14, 6:20; mile 15, 6:23; mile 16, 6:19; mile 17, 6:09; mile 18, 6:08; mile 19, 6:12; mile 20, 6:15. I was repeatedly told by spectators that I was in fourth place. (The marathon runners were easily identifiable as we were wearing yellow arm bands that we picked up at mile 12.) Yes, I had picked up the pace, and I was feeling good. It was then that the unexpected happened. I had taken a Gu 15 minutes before the start, and had packed two additional Gus and a packet of salt tablets in each of the back pockets of my shorts. The pockets were kept closed by a thin strip of Velcro, which evidently doesn’t work very well when saturated with sweat. One Gu and one packet of salt tablets had fallen out of my pockets, and I hadn’t noticed until I reached for them and they weren’t there. To add insult to injury, the Heed at most of the aide stations was very weak, and I began craving salt. I began slowing down and even stopping at the aide stations to stay hydrated, but to no avail. I became increasingly thirsty. I passed the then third place runner at mile 22. I shouted words of encouragement and was on my way. The last 5.2 miles of the course were brutal, and I would suggest that the race organizers consider changing the route. The course traveled through neighborhoods with dogs running loose and over dirt roads with potholes. Ugh. After running 22 miles, no one wants to have to pay attention to potholes. In addition, there were numerous turns, many of them sharp, and there were two separate occasions where the volunteers had to shout at me, as I had missed the turn. It was also at mile 22 that my arms began to tingle, and I began to become light-headed. My thirst was unquenchable. Mile 21, 6:20; mile 22, 6:31; mile 23, 6:46 (the wheels begin to come off of the bus); mile 24, 6:35; mile 25, 6:47. I had slowed down significantly. I also began to become somewhat incoherent. I was seeing spots. I was losing my peripheral vision. Jeff met me, and held me up as we walked to the first aid station. I was provided oranges and Sponge Bob Band-Aids. I don’t recall much of what transpired in the next 20 minutes, but it involved four visits to the first aid station, changing out of my dripping wet clothes, dousing myself with cold water in an attempt to cool down, and eating a couple of cookies. I also had a small glass of delicious, cold beer. Jeff and I attended the Awards ceremony, emceed by a former student, Tom C. The top 5 male finishers received a nice pint glass and a check. As Tom announced me as the third place finisher, he said, “Paul also gets the ‘hero’ award for making it to the finish after falling.” I then pretended to fall as I received my award. Hey, I have to laugh at myself, don’t I? This was my 26th marathon/ultra, and never before did I test the limits of my endurance. After every other race, I felt like I had a least a little bit left in the tank. Not this time. I gave 100%. I was completely empty. Unfortunately, this happended before I reached the finish. Yes, I’m disappointed that I didn’t reach my ideal goal. Given how uncertain I was going into this race, I am, believe it or not, more confident that I can run a 2:45 or better marathon. I have a tough choice: do I run a marathon or ultra this summer or do I focus specifically on Chicago in October? Look for updates. Uhm, this was one of the most challenging 10k races I’ve run, as the course, advertized as “rolling hills,” did indeed have hills, only they weren’t rolling. They were steep! It was a well-run race and a tremendously fun event. The race was also a fund-raiser held by the American Cancer Society. Jeff and I arrived at the event at 7, picked up our race packets (with many niceties), and I ran a warm-up mile or so. The race started at the center of town, and it was there that I saw Heiko, Dan, and Jason, fellow Godivans, as well as the always delightful Lauren (Jason’s spouse), and Paula and Carl. I also met Cherie and her husband, who both spin with Jeff. I had teased Heiko and Jason prior to the race, and accused both of them of sand bagging. I had informed them that I would be running the race with Jeff; thus, they accused me (rightfully so?) of sand bagging as well. Ha! The race started promptly at 8 for both the 5 and 10k races. I immediately took the lead, and held it to the finish. I was but 10 second into the race when I heard Jason yell, “Sand bagger!” The 5 and 10k racers quickly parted ways, and it was then just me following the lead bike. It was nice following the biker as he led me through every turn. The end of the race was one last steep uphill climb. I tried to kick it, but there were far too many 5k runners in my way. I was pleased with my time, particularly given the course. The 2nd place racer finished 4 minutes behind me. As soon as I finished, I grabbed a water bottle and raced back to find Jeff. (I always get weird looks when I’m running that fast in the opposite direction of the race, even if I make sure to take off my bib.) I caught up with him when he had just a little less than a mile to go. This was his first 10k, and I was very proud that he finished in 55 minutes. Once I saw that he was okay, I again ran back to run in Cherie. She was delighted that I did so, and thanked me far too many times. The awards ceremony, although far too lengthy, was nonetheless nice in that a hot breakfast of eggs, bagels, biscuits, gravy (gross), oatmeal (yum! ), and hot coffee were served. I also received a gym towel, a hand-blown green (St. Patrick’s Day) glass and soap dish, a bar of Irish Spring soap, and a shamrock finisher’s medal.